he Marine Corps reactivated the 2nd Marine Expeditionary Brigade Command Element 20 Nov 2012 aboard Camp Lejeune, N.C.
As a subordinate command of II Marine Expeditionary Force, the reactivation of the 2nd MEB Command Element is in line with the Commandant of the Marine Corps’ direction to stand up a permanent command element at Camp Lejeune. The re-establishment of the permanent command element strengthens the Marine Corps’ ability to prepare for and respond to crisis and contingency operations that may occur around the world. 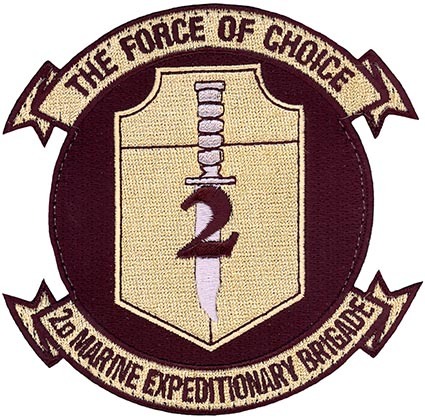 The reactivation of 2nd MEB, commanded by Brigadier General John K. Love, will provide II MEF and the nation with a rapid response capability centered on a one-star staff to execute a range of missions. It will enhance the Corps’ expeditionary readiness by providing a scalable, standing, joint-capable, deployment-ready headquarters element that can also enable the introduction of follow-on forces if required. The 2nd MEB Command Element is scheduled to be fully operational capable by the end of fall 2015. In September, Secretary of the Navy Ray Mabus presented the highly esteemed Presidential Unit Citation to 2nd MEB for outstanding performance in action against enemy forces while designated as MEB-Afghanistan during Operation Enduring Freedom in Afghanistan from May 2009 to Apr 2010.